New, more powerful 6.6L V-8 gas engine with direct injection for greater performance and stronger trailering capability with 21 percent more torque and up to 18 percent more towing compared to previous 6.0L gas engine. "We set out to make the best HD trucks on the market, bar none," said Jaclyn McQuaid, chief engineer, Silverado HD. "We increased towing capabilities across the line, not just for dually buyers. We added class-leading towing technologies, such as 15 available camera views, to make trailering more convenient, whether pulling a large cargo trailer or fifth-wheel camper. And we made a host of changes to make tasks easier." 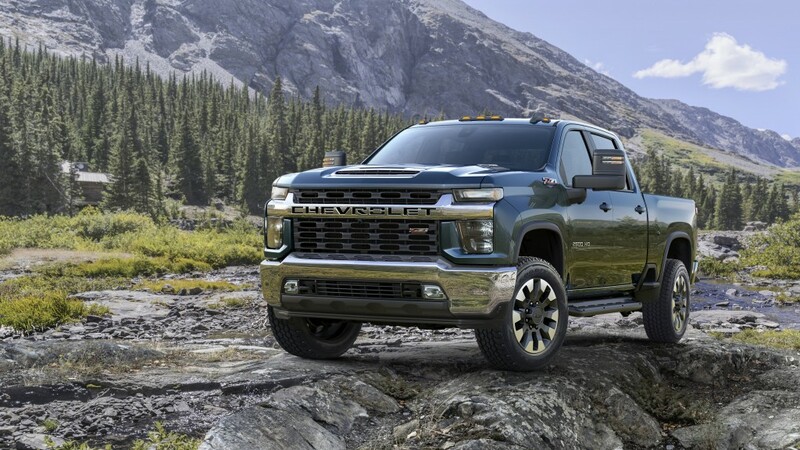 Built at the Flint Assembly plant in Flint, Michigan, the all-new 2020 Silverado HD is longer, wider and taller than its predecessor with a wheelbase that's been stretched 335 mm (5.2 inches) on Crew Cab models and is scaled for HD customers. The Silverado HD will be available in five distinct trim levels — Work Truck, Custom, LT, LTZ and High Country — available across 22 cab, bed, chassis and driveline configurations. Customers can choose between two new powertrains. The standard engine is a new 6.6L V-8 gas with direct injection making 401 hp and 629 Nm (464 lb-ft) of torque mated to a six-speed automatic transmission. That's an 11 percent increase in horsepower and a 21 percent increase in peak torque, respectively, resulting in 18 percent more towing capability. Then there's the legendary Duramax 6.6L Turbo-Diesel V-8 engine making 445 hp and 1234 Nm (910 lb-ft) of torque coupled with an all-new Allison 10-speed automatic transmission. In addition, every component between the transmission and the wheels has been upgraded to enable an available 52-percent increase in max towing capability — now up to 16,102 kilograms (35,500 pounds) on Regular Cab, two-wheel drive, DRW, diesel models. All-new Allison 10-speed automatic transmission is matched with the available Duramax 6.6L V-8 Turbo-Diesel engine for a 52 percent increase in max towing to 16,102 kilograms (35,500 pounds) on properly equipped models. Autotrac active two-speed transfer case on 4x4 models electronically controls "4 Auto" mode, allowing the truck to seamlessly shift between two-wheel drive and four-wheel drive based on road conditions. Advanced Trailering System technologies and new transparent trailer view: The in-vehicle trailering system features an available total of 15 available camera views (requires an installed accessory camera), such as HD Surround Vision and other unique views including a transparent trailer feature to help provide added confidence when towing. Also features increased integration with the myChevrolet mobile app. HD-exclusive sculpted exterior design features the most differentiation from the Silverado 1500 ever — the roof is the only shared sheet metal. Heavy-duty details designed to make work easier and more intuitive, including features such as an easy-access engine block heater outlet, easy-to-fill diesel exhaust fluid (DEF) tank with opening inside the fuel door, a more integrated snow plow prep package and new, advanced trailering mirrors with available spot lamps and more. BedStep feature and larger CornerSteps makes it easier to load or reach items in the cargo box, which is designed to hold a pair of size-12 boots and up to 226 kilograms (500 pounds). Larger cab enables more spacious interiors with Crew Cab models adding about 3 inches in overall length. The 2020 Silverado HD increases towing capability across the lineup compared to 2019. This greater capability is driven by chassis and suspension enhancements and new propulsion combinations that work seamlessly to offer confident performance with great durability, particularly when towing. An enhanced version of the Silverado HD's sturdy, proven ladder-frame design, with boxed rails that improve strength and contribute to a smooth ride, is the foundation for the new truck. It's a heavier-duty frame compared to the current model, designed to handle the truck's higher loads, including a higher gross combined vehicle weight rating (GCWR) of up to 19,731 kilograms (43,500 pounds) on properly equipped trucks. To handle the increased towing capability, the upgraded driveline includes new, larger, more robust front and rear axles, a standard 11.5-inch ring gear on 2500HD models, and a massive 12-inch ring gear on 3500HD diesel models. Also, 30-percent larger-diameter prop shafts provide greater strength with the high torque output of the new 6.6L gas engine and the Duramax Turbo-Diesel. Helping cool the Duramax engine is a massive 28-inch diameter fan with variable fan speed - 2.5-inches larger than the current fan. That greater towing capability is matched with Chevrolet's new suite of customer-focused trailering technologies, including a new transparent trailer feature, designed to help improve the experience with visibility, easier hitching and more driving confidence when towing a trailer. More than 90 percent of heavy-duty truck owners use their truck for trailering, making it one of the most important considerations for customers, with safety, confidence and visibility their top concerns when towing. The 2020 Silverado HD delivers with an Advanced Trailering System designed to make every aspect of towing easier and more convenient. The 2020 Silverado HD offers up to 15 unique camera views, including HD Surround Vision, Bed View, an industry-first transparent trailer view, and an accessory camera. The transparent trailer view helps with visibility through the trailer as if the trailer was not there providing added confidence when towing. The transparent trailer helps with navigating parking lots, merging into traffic or when making tight turns. It uses two cameras — one tailgate-mounted camera and an available accessory camera (installation required) mounted on the rear of the trailer — to provide a wide display that helps the driver to virtually see through and alongside the trailer. Another new feature we're developing is the new smart trailer integration, which is designed to work with ASA Electronics iN∙Command control systems. The system is being designed to integrate with and be accessed through the myChevrolet mobile app, either on compatible Android and iOS smartphones, or on the vehicle's infotainment system via Apple CarPlay or Android Auto.The iNˑCommand control system allows owners to monitor and control a range of smart systems, such as water tank levels, HVAC controls and even power slide-outs, in recreational trailers equipped with the technology. Other towing technologies include an in-vehicle Trailering App complete with trailer light test, trailer electrical diagnostics, trailer tire pressure and temperature monitoring, maintenance reminders and pre-departure checklist. Many of the in-vehicle Trailering App's functions, including trailer profile creation and trailer light test, are also available with the myChevrolet mobile app, a feature that offers convenience when the owner is outside of the truck or trailer. The 2020 Silverado HD also includes a VIN-specific Trailering Information Label, something no competitors has, that clearly lists the truck's specific trailering metrics including curb weight, gross vehicle weight rating (GVWR), gross combined weight rating (GCWR), max payload, max tongue weight, gross axle weight rating (GAWR) and fifth wheel and gooseneck ratings. Auto Park Brake Assist automatically initiates the electronic parking brake to help hold the truck's position and vehicle creep when hitching a trailer. All-new Park Grade Hold Assist enhances hill hold by using braking effort at all four wheels to help keep the truck in place for an extended length of time. An enhanced integrated trailer brake controller works with the trailer profile in the Advanced Trailering System to recall a specified trailer's most recent gain setting. An enhanced Tow/Haul mode remains engaged on the next key-on cycle, for up to four hours and includes a reminder that the feature is engaged. Trailer Sway Control and Proactive Rollover Avoidance. Enhanced Digital Variable Steering Assist dynamically optimizes power steering according to driving scenarios and enables features like road pull compensation.